Neuromas are a common issue with runners. Neuromas in the feet generally produce a scorching sensation or numbness in the front of the foot near the toes. This occurs from swelling of the nerves in the foot that happens because of tightly fitting shoes and the pressure that occurs from wearing them. Moreover, runners place abnormally high amounts of pressure on the foot, which causes similar stress on the nerves. This condition is often referred to as Morton's neuroma, which is an amplification in the size of a nerve at the foot’s metatarsal bones. The nerve becomes so large due to inflammation that it cannot fit between the bones. However, if the enlarged nerve develops fibrous tissues around it, more severe procedures will be required to treat it. Symptoms of this condition include discomfort on the bottom surface of the foot, especially near the toes. This pain can be mild or severe, depending upon the extent of severity of this condition. · Refraining from wearing shoes that squeeze the sides of the foot. Runners should make sure to utilize the same advice with choosing their footwear as well. · Using of socks that spread the toes, perhaps overnight, to help minimize tension caused by toes rubbing together. · Injections of cortisone to help decrease inflammation of the nerve. · Surgical procedures may be required if the injured nerve does not respond to conservative treatments. This will include removing the nerve completely, which is generally accessed through the top of the foot to help with healing. 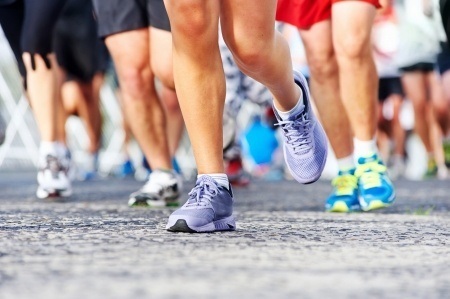 Neuromas can inflict many individuals, including runners, with severe pain. Please contact us at Palm Beach Orthopaedic Institute, located in our West Palm Beach, Jupiter, Wellington and Palm Beach Gardens, Florida locations to get the very best care for your neuromas. Our podiatrist, John Schilero, DPM, can help to provide you with quality treatment that can help you with running the mile with reduced pain! Make an appointment by calling our office at 561-694-7776 EXT. 41 and take a look at our Patient Education section for further guidance.